Here's an idea for setting up for a baby shower. 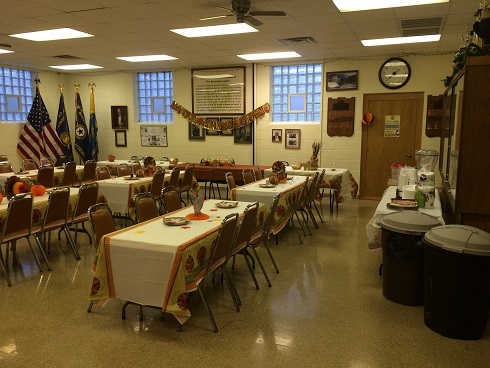 Clubhouse decorated for Thanksgiving event. Our Post 501 hall is available for use for receptions of all kinds - weddings, birthdays, baby showers, funeral wakes - all kinds of celebratory functions. The person capacity runs between 60 - 70 people, depending upon table arrangements. Kitchen facilities are available, along with two clean and modern rest rooms. Set up may be made available the day ahead of time, for the full day rental, with advance coordination. Contact the post at either the phone number listed below, or use the “CONTACT US” link above. A $50 security deposit is required upon booking. There will be no cost for military unit functions, such as Holiday, unit party, etc. Our Post’s Memorial Hall is available free of charge to members only in times of a family loss. Contact the Club at 608-244-7716 for details. Post 501 Legion hall will be clean and presentable prior to occupancy; however, let us know if tables/chairs need to be adjusted. If kitchen facility support is needed, be sure to let us know, in advance, of your requirements. There may be some additional fees depending on services, equipment needed. Facility clean up by your party is expected after the event is ended. Prior to occupying the hall, a unit/personal representative will need to review and sign a contractual agreement for the event. Be aware our Legion Post does not have a liquor license nor will our liability insurance provide coverage for alcohol related incidents. Therefore, no alcohol is permitted within our facility. Parking for about 20 automobiles is available on site, with additional convenient street parking on both sides of Dempsey Road. Should you be interested in checking out our facility, contact our Post, phone number is listed below, or go to our "Contact Us" tab above.